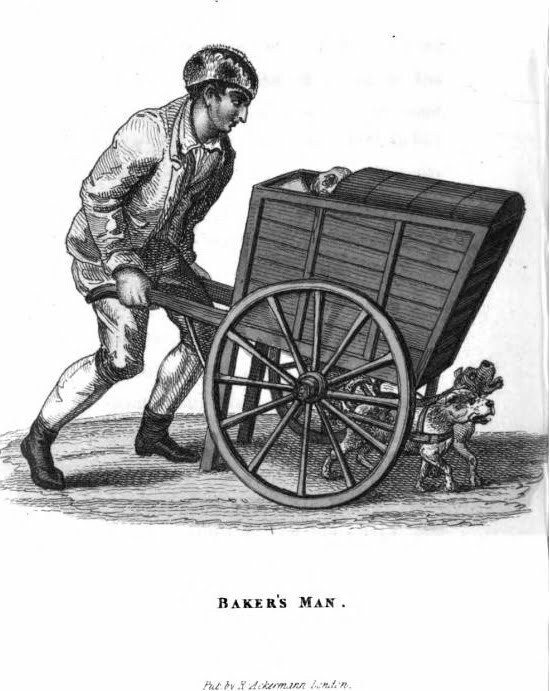 The following excerpt from 1827 describes "the incessant bawling of" street vendors to the annoyance of those "who have not the happiness to be deaf." From the "muffin man's little bell," the bakers barking dogs, to a "stentorian bawler" for beer bottles until "the characters thicken, and tenfold cries distract the worried ear." "The cries of London are no small nuisance to those metropolitan students who have not the happiness to be deaf. Some streets are so infested with the incessant bawling of itinerants, that, to persons whose nerves are not callous by custom, the misery is extreme. 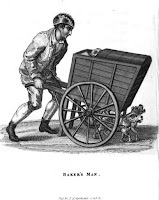 An old gentleman, a bachelor, having no better occupation, and living in lodgings in one of the streets near Fitzroy Square, remarkable for its population, nearly all the houses being let to lodgers, determined to take an account of the criers, as they succeeded each other, from morning until night. His account is sufficiently amusing. As soon as the watchmen have ceased to bawl, the chimneysweep is heard, loud and shrill, calling "sweep;" then is heard some stentorian bawler, with, "any beer bottles or vials to sell?" Scarcely has he commenced than the tinkling of the muffin man's little bell, which has not reached the ears of the inhabitants, ere it is drowned in the still noisier tintanabulum of the dustman's bell-clapper, which never ceases. 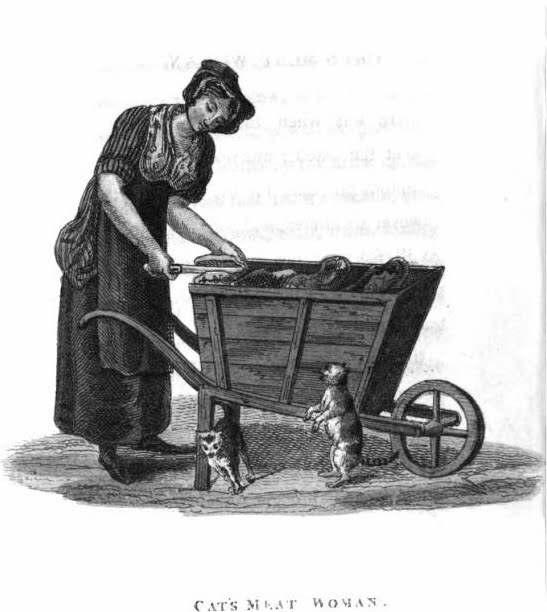 Then comes a baker's truck, drawn by two barking curs, who set all the stray dogs in a parish in full cry. Water cresses, old clothes, hearth stones, hare-skins, rabbit-skins, with Dew milk from the cow. These occur in rapid succession, before the good people within doors descend from their dormitories to breakfast. 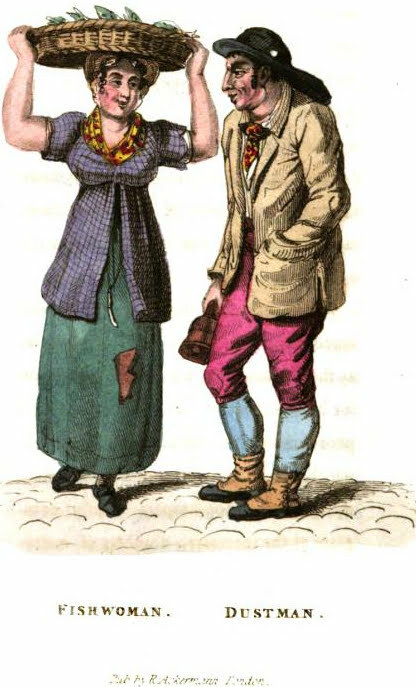 Then commences another act of the bawling drama, in which the characters thicken, and tenfold cries distract the worried ear; dainty green turnip tops, Newcastle salmon, green and young bastings, oranges and lemons, old chairs to mend; and here the old gentleman broke off, exclaiming, if I proceed with my catalogue, it will drive me mad."